If people of Asian or African origin living in Britain allow themselves a lively historical memory - which may not be wise if they want to do well in our society - then they will have a lively consciousness of the immensely disruptive effect British values had on their own culture and way of life. In the first part of this essay (The English Ideology) I described how the society which had drained the idea of spiritual struggle out of its own public life had then gone on to dominate societies, Hindu and Muslim which were still centred on the idea of the spiritual struggle. I pointed out that the British victory in the First World War had resulted in the destruction of three great religiously based Empires - Muslim Ottoman, Catholic Austro-Hungarian and (perhaps more accidentally) Orthodox Russian. From the British point of view, however, we were performing a service to the world by waking it up from a long sleep safe in the arms of ancient, usually religious, tradition. And it must be said that something of this view of things did rub off on the peoples concerned. This 'British values' website includes an article by Abdul-Azim Ahmed, from Cardiff, one of the editors and leading bloggers of the online journal On Religion, giving a brief rundown of the different branches of Islam that are active in Britain. The main point he wanted to make - a point certainly worth making - was how various British Islam is - a variety obviously due in part to the variety of countries of origin. But one thing that interested me was that quite a lot of these Muslim groupings are fairly recent in origin, formed in the nineteenth and twentieth centuries in response to the impact of European, largely British, Imperialism. And one of their motivating arguments was that if everywhere in the world Islam was being defeated by Europe, then Islam must be doing something wrong. The Deobandi movement in India, for example, and the Salafi movement in the Middle East, had a Protestant character to them. As the Protestants wanted to get rid of all the rich cultural traditions that had accumulated within Catholic culture to return to the primitive simplicity of the early Church, so these movements wanted to get rid of all the rich cultural traditions that had accumulated within Islam to return to the days of Muhammad and the first Caliphs. They felt that these traditions had become an obstacle to the development of the sort of practical knowledge - the industrial and administrative expertise - that had ensured the superiority of Europe, Britain in the lead. It was this - nothing to do with democracy, respect for other peoples opinions, individual liberty or even the rule of law (Islam, like Judaism, is a law-based religion) - that constituted what they experienced, and what they admired, as British values. 'A cursory glance over the events of contemporary history reveals that whereas in the sub-continent, a few individuals only had cast off slumber, entire nations had arisen in the West; and whereas a little work was done only in one direction here, a thousand times greater progress was made there in almost all directions. No aspect of life remained in which quick headway was not made. Here, only Shah Waliullah and his sons wrote a few books on certain subjects which could only reach and influence a very limited circle: in the West whole libraries were produced on almost all arts and sciences which dominated and possessed the whole intellectual world in no time. Here, the study of philosophy, ethics, sociology, politics and economics in the modern way remained in the elementary stage without further progress; in the West entire systems of thought in these subjects were propounded, which had lasting impact on all ways and aspects of life. Here the knowledge of physical sciences and material forces had remained static for five hundred years or so; in the West these branches of knowledge made tremendous progress and gave such powers in the hands of the people that encountering them with the out-moded weapons and devices became well nigh impossible. 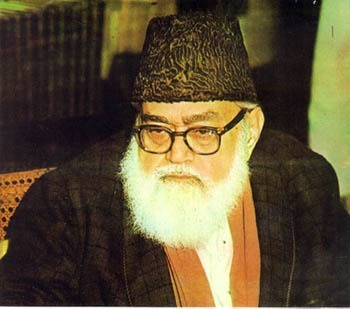 (1) Sayyid Abdul A'la Maududi (trans Al-Ash'ari): A Short history of the revivalist movement in islam, Lahore, Islamic Pubications Ltd, 1979 (1st d 1963), pp. 118-120. Nothing to do with democracy or individual liberty.